Miele Kitchen Experience - minimalism at its best. Washes for you, dispenses for you, perfect for you. Miele. For everything you really love. aesthetics captivate the imagination of architects and interior designers alike. Timeless elegance, in-jecting lifestyle into rooms and turning the kitchen into a design masterpiece. 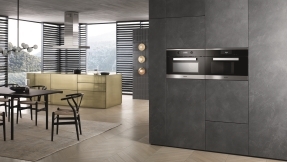 Our expert team of Miele product designers have brought this vision to life: with Miele Pure Line. Our laundry care system covers the entire process, from washing and drying to ironing. Even the detergents and conditioning agents were developed in our own laboratories and have been perfectly formulated to suit Miele appliances.